The bodies pile up at Marshfield, Gloucestershire, England on Boxing Day 2007. 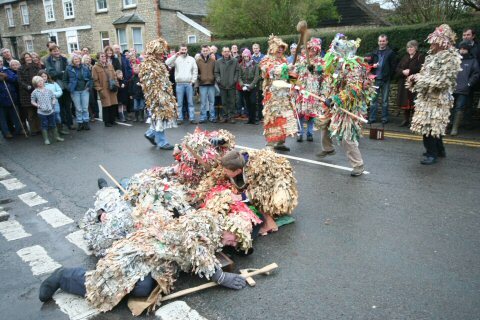 During the final performance by the Marshfield Paper Boys on Boxing Day 2007, King William went berserk and took on all comers - including Old Father Beelzebub. The result was that an unprecedented pile of bodies built up - too many for the usual mat placed on the ground for the fallen victim. Fortunately, the Doctor was effective as ever.